Interested in getting paid to help fellow Aggies? Want to Live at the Heart of the Aggie Experience? Looking for ways to add to your résumé? Academic Peer Mentors (APMs) are an important component of the Department of Residence Life (DRL) and its mission to offer Texas A&M University students a world-class on-campus student living and learning experience. This dynamic student worker position promotes and enhances the academic success of students. APMs support students’ academic development by connecting students with resources and programs to enhance student learning. APMs are required to live in the residence halls/apartments on-campus and foster a sense of academic community while also providing academic programming on campus. 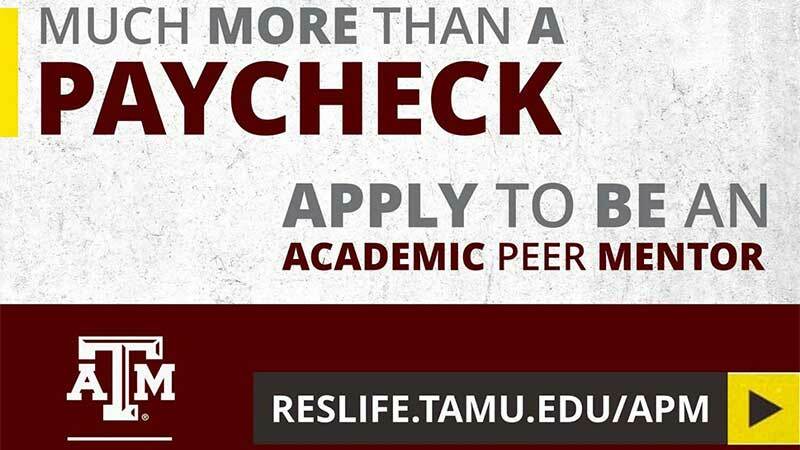 For more information regarding the position, a full position description, details on compensation, and application instructions, please http://reslife.tamu.edu/employment/apm. Final Deadline: Wednesday, January 18th by 11:59p.m. If you have any further questions or would like to find out how to talk with a current Academic Peer Mentor, please feel free contact us. Commitment to Inclusion: The Residence Life community at Texas A&M University is comprised of a diverse group of students and staff living and working together in a residential environment of residence halls, university apartments, and administrative staff offices. Together, we strive to include all members of our community; believe that differences provide opportunities for growth and mutual understanding; are committed to creating a socially just community of respect, caring and support; and seek opportunities to celebrate the community of individuals regardless of ability, religious affiliation, veteran status, socio-economic status, ethnicity, nationality, sexual orientation, age, gender, race or cultural identity.